Sri Kala Bhairava is a fierce manifestation of Lord Shiva and is the Lord of Time. Sri Kala Bhairava provides you with the vision and the drive needed to make intelligent and effective use of time. Kala Bhairava is the Lord of Time and he can change your bad time into good time. Sri Kala Bhairava carries a trident, a drum and the severed fifth head of Brahma. He is considered to be the vanquisher of death. His third eye represents eternal supreme wisdom. Daily prayer offerings to Sri Bhairava helps in achieving success, defeating enemies and attaining all materialistic comforts. He helps devotees fruitfully utilize their time in securing their goals. He purifies souls with his sheer power and makes odds favorable for believers. Almost miraculously, one is at the right place at the right time for the best of opportunities. Lord Bhairava is also known as ‘Kshetrapalaka’, the guardian of the temple. The keys to Shiva and Shakti temples are ceremonially submitted to Bhairava at closing time and received from him at the opening time in the morning. Sri Kala Bhairava manifested when the Asuras tried to prevent Lord Shiva Bhagwan from performing the dissolution of the universes. 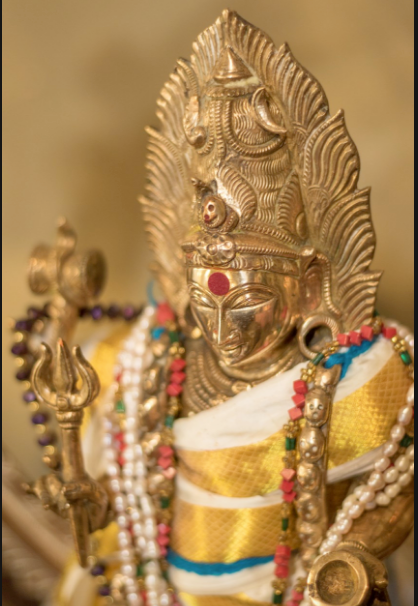 The demons did not want the dissolution as they can enjoy the negative aspects that exists in us such as anger, depression etc and from that Lord Kala Bhairava was created as an intense aspect to destroy those demonic elements and help Lord Shiva continue the dissolution process.